When I think of Palm Springs I think of a resort like town filled with pools, palm trees and lots of picture perfect bougainvillea. I tend to forget Palm Springs is a desert town filled with an abundant amount of sand, desert plants and surrounded by picturesque mountains. When we drove up I told my husband I had to capture the desert side of Palm Springs but it wasn't as easy as we thought it would be. I kept my eyes peeled for an abandoned road that would take us to the middle of nowhere but I never found it. As soon as we passed by the Palm Springs Welcome Center I knew that it would be the perfect location to capture the true beauty of this desert town! As usual, I totally overpacked for Palm Springs and had too many outfit's to choose from. 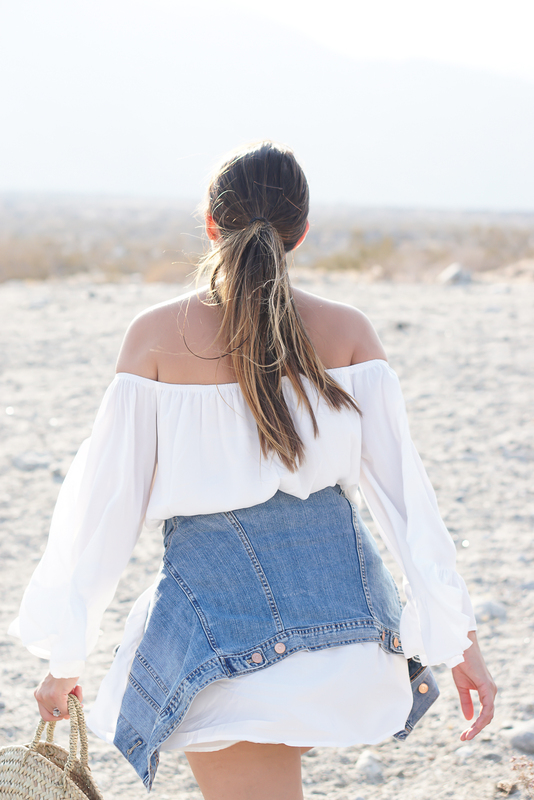 I couldn't figure out what outfit would look perfect in front of this beautiful desert backdrop until my husband decided to chime in and choose this simple white off the shoulder dress from SheIn. It was the perfect choice!! The white dress I'm wearing was a hit and the perfect length for a tall girl like me! I'm not going to lie but the dress was slightly see threw. My solution to this issue was to wear my black biker shorts underneath which worked perfectly! I added a jean jacket to this look to define my waist and cover my bum in case the winds decided to pick up, which they did! You already know I'm obsessed with my round wicker basket/bag. It's not by a big designer or a main stream brand it's just a unique find from Etsy! I have no idea why but I'm really digging SheIn at the moment!! I never really trusted any of the discounted Chinese websites because I am not a stick thin short girl who wears a size zero. A few years ago I had ordered a few items from a different Chinese website and all the dresses looked like shirts on me and all the shirts were so small and cheaply made I just couldn't make them work. I swore off ever buying anything overseas again. Then, I kept seeing regular sized girls rocking SheIn clothing so I decided to give them another try and I am so happy I did!! Of course there will always be hits and misses but for the most part they are all hits in my book. Palms Springs, you stole my heart once again! I will be back very very soon! XO your biggest admirer Shirley!